So here we are in 2006 and, as Dan is fond of pointing out, we don't have our flying cars yet. Hell, we don't even have proper electric cars. To add insult to injury, not only are my vat-grown, astigmatism-corrected eyes not yet ready, my computer and stereo still spawn a spaghetti of leads (to coin a new collective noun) around themselves. As I recall, Bluetooth and its kin were supposed to solve all our cabling problems some years ago, but apparently no-one told the universe. Part of the problem is that, ultimately, desktop users don't really seem to care all that much about cables. Or, more to the point, they don't care enough to shell out extra dollars for wireless stuff when good old fashioned copper will do the job more cheaply and without batteries that need replacing or charging. Once a cable is in place, it usually needs little maintenance. But steady progress is being made, and the market for wireless widgets of all shapes and sizes is growing, slowly but surely. Wireless keyboards and pointing devices are not uncommon, and they're far less brick-like than they were in the early days. There are also good reasons to shell out the extra cash for them. Home theatres and office presentation rooms can benefit enormously from a wireless keyboard and mouse; you don't want dangly cables in either environment. Good old Gaffa tape can help alleviate the problem, but once that's employed your portability factor plummets, as most likely does your client's opinion of you. That's why you might want one of these. They're all made by the Taiwanese company Globlink, and all three operate using a custom RF wireless interface. The two keyboards both have integrated trackballs, and the pointing device (ok, it's a trackball too) has a twist. The silver keyboard is the "Slimline" wireless model. 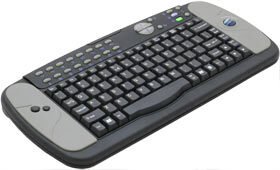 The chunkier black version doesn't have an official designation on the Globlink site, but Aus PC Market (through whom Australian and New Zealand buyers can acquire these gadgets), call it the "Multimedia" model, due to the larger collection of extra function keys above the keyboard itself. 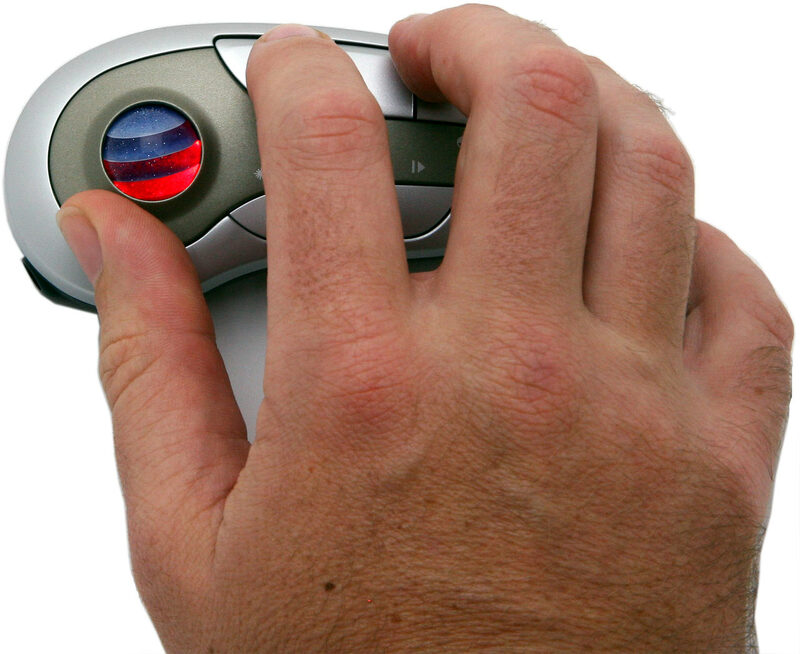 The standalone trackball's officially called a "Wireless Optical Presentation Mouse", although it is not, as more perceptive readers may have already noticed, actually a mouse. It's a trackball with a couple of extra buttons, and a laser pointer built in. 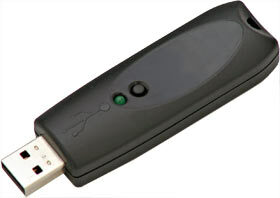 Aus PC Market compromise and call it a "Wireless Presenter/Mouse". They have very similar layouts. There's no numeric pad, but they use the standard laptop trick of letting you use the columns of keys under 7, 8 and 9 as a numpad when you turn on Num Lock. Apart from that, they have the traditional arrow and Windows keys, as well as a "Fn" key to access other laptop-style secondary functions. 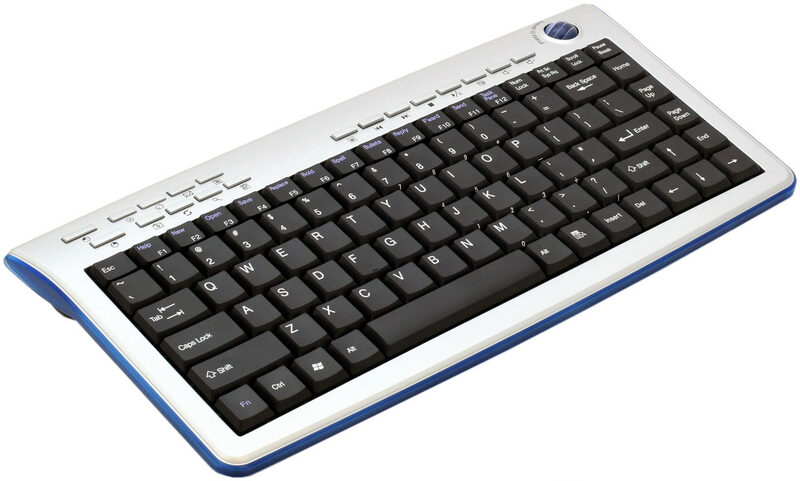 The Slimline keyboard has 16 buttons up the top, which trigger pre-assigned functions that you can't change. These include audio mute, volume up/down, basic browser functions (reload, stop, home), Internet and mail, media control (play, stop, next track, previous track) and a few other miscellaneous functions like Windows search. The media control keys all worked fine with Windows Media Player, Media Player Classic and Musicmatch Jukebox, and Winamp too once you turn on Global Hotkeys. Your favourite media player's mileage may vary. There are also buttons to launch Word, Excel and PowerPoint, but these don't work unless you install the moderately hideous supporting software that come with the keyboards. In addition, you get a bunch of secondary functions assigned to the top row of the keyboard, that basically simulate common key presses - for example, the "bold" key (Fn-F6) sends a Control-B, and the "reply" key sends Control-R. Myself, I find hitting Control-B or R just fine, but there you go - choice. The Multimedia keyboard has no fewer than 28 function keys [I can hear the ClickyKeyboards.com guys screaming from here... -Dan], all of which work without installing any special software. You get all of the functions on the Slimline plus more, including a key to launch your default media player and one to launch the calculator. You also get a bunch of macro-type keys that, like the function keys on the Slimline, simply send key combinations like ALT-TAB and ALT-F4. Personally, I see the novelty of pressing smaller, out of the way keys to cut and paste wearing off quickly. But if it floats your boat, who am I to argue. 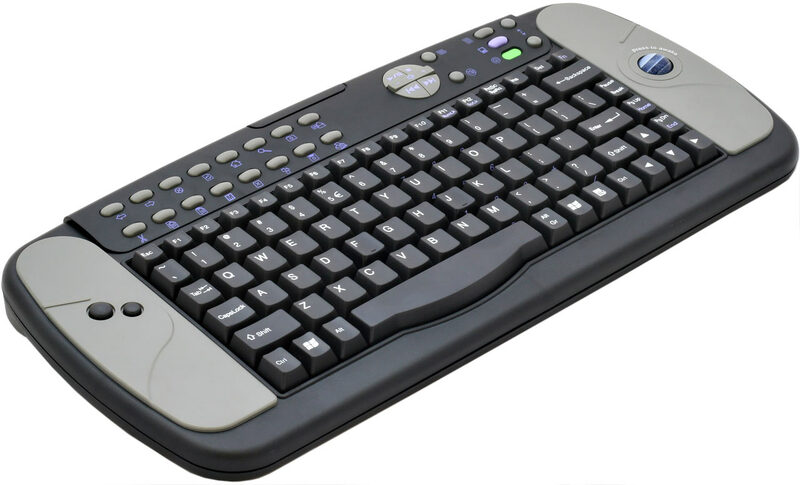 Both keyboards and the pointing device have the same type of optical trackball fitted, as well as two buttons to emulate left and right mouse button clicks. The trackballs are made from layers of clear plastic (with little sparkles throughout) sandwiched by layers of a more opaque plastic. Presumably this is designed to present a good surface for the optical sensor to track, as well as being pretty. Both keyboards power their trackballs down after a period of inactivity to save the batteries, and you have to pressed the ball inward to wake it up. This is a bit annoying at first, but you get used to it, although the Multimedia keyboard seems to put its trackball to sleep much more quickly than the Slimline. The Presenter's trackball is always on. At first, it seems like it would have been a good idea to make this click-to-wake action also simulate the left mouse click, but then you realise it would have made dragging windows around a rather unpleasant experience. In general, the trackballs work quite well once you get the hang of them. Occasionally they suffer from moments of drift, which isn't good, and it can be hard to perform operations requiring fine control (the Presenter can be particularly challenging when hand-held). Both keyboards have their trackballs on the right, and the "mouse" buttons on the left. This may be irritating to fellow lefties like me, although I didn't find them too hard to cope with. Internally, the trackballs' design is quite simple. This is the unit from the Slimline keyboard. You can see the illumination LED, and the sensor under the ball itself; the ball's suspended on three small ball bearings. The microswitch on the underside is the trigger to wake the unit up - pressing down on the ball squishes the whole assembly onto the keyboard's bottom casing. It's a little rough-and-ready, but it should last well enough, as the amount of travel in the whole system is quite limited. 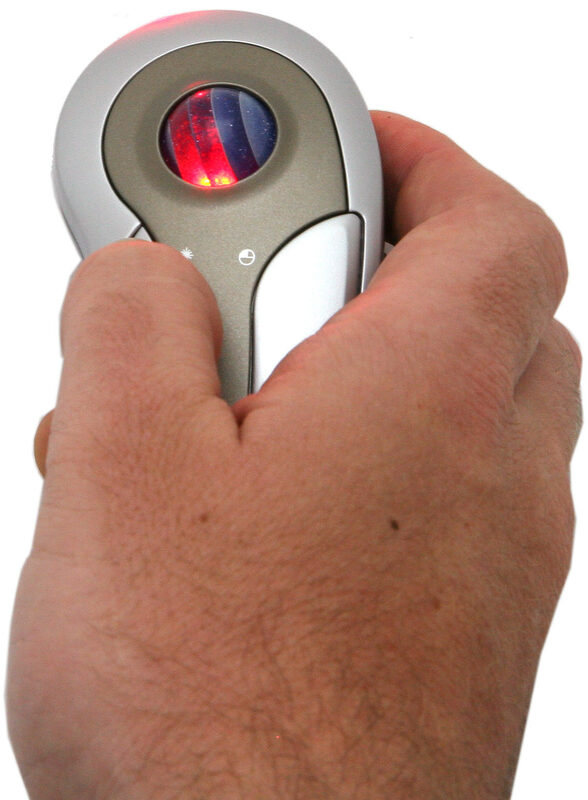 The Wireless Presenter is basically just a trackball. In addition to the two standard mouse buttons, you get a pair of scroll buttons (which appear to simulate the page up and page down keys), and a button to trigger its LASER, MR BOND. Ahem. The laser in question is your typical low-power red model, suitable for emphasising stuff to management and exercising pets, and totally unsuitable for liquidating members of Her Majesty's Secret Service. It is to Dan's green monster as a Barina is to an RX-8, but it does its job quite serviceably. Interestingly, the unit can be used in two different ways; there's little switch on the side to swap between them, and "off" mode. Mode one is flat on the desk, with the buttons facing up and the trackball on the left. 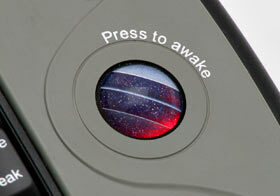 Mode two is as a hand-held device, with the buttons on the right and the ball up the top. The mode switch simply changes the axes of the trackball. It's this mode that the laser is designed for. As a professional nerd, I wear a few hats, but all these hats involve keyboards, so, like Dan, I am a long-time convert to the Cult of the Buckling Spring. A few years back, I invested in a couple of Unicomp's Customizer 104-key jobbies (unlike Dan I have no loathing of the Windows key), and while they cost a packet to get shipped to Oz, they were a worthwhile investment. I have no doubt that I will still be typing on them when I'm much old(er) and grey(er). I installed one of those keyboards on my home PC (to annoy the neighbours), and the other stayed at my (now defunct) day job (to annoy my co-workers, and make my bosses believe I was squeezing out twice as much code). At any rate, as a result of the above, I tend to be somewhat picky about what constitutes a pleasant keyboard to use. The Slimline doesn't score too highly in this regard - its keys have a fairly small amount of travel, and you need to press them quite hard before they register. They also lack a distinct point at which you can "feel" that you've pressed the key. It's pretty much up there with the worst offerings of the laptop world a few years ago, with extra springiness to boot. The special function keys are particularly bad - you can't even tell if you're pressing them except by looking at the little light on the receiver dongle that flickers when it's receiving data. The Multimedia keyboard may be uglier than its sleek, silver counterpart, but it has a much nicer feel. The keys have a lot more travel, and feel more like a proper desktop keyboard than a laptop one. My only gripe with it is that it doesn't have flip-up feet on the back to prop it up at an angle, so it's disturbingly flat to type on. All of these devices operate on the 2.4GHz ISM band, which is also used by Bluetooth and wireless networks. As such, they suffer from the same potential interference problems; thick steel walls and swimming pools will not be kind to your signal. The dongles all look the same, and come with a short (5cm) USB extension lead to alleviate any potential crowding of your USB ports. There's a small button on the dongle which you press to put it into sync mode. Once you press the corresponding "connect" button on the device, the dongle's light comes on, and away you go. Each device requires its own dongle - you can't sync more than one device at a time - and each dongle is uniquely coded to work only with the correct device. I managed to sync the Multimedia keyboard with the Slimline's dongle, but the keys were completely remapped and the trackball's horizontal and vertical axes were reversed. All three devices co-exist quite happily, though; I didn't have any problem using them all at once. I'm sure this will be extremely handy for most users. Range-wise, I wandered all over my rented Queenslander with both keyboards, continually pausing and unpausing Winamp. It's not a huge house, and the PC is fairly centrally located. I started to run into range issues only at the extremities of the house, and in the yard it stopped working altogether. Overall, the Presenter had the longest range, with the Slimline coming in second and the Multimedia keyboard last, but there wasn't much in it - only a couple of metres. All up, the useful range was around 10 metres (30 feet). This is a little less than the stated range of 15m (45 feet or so), but given that various walls were in the way it's pretty much what you'd expect. Both keyboards were fully usable in the room next to the computer, where the telly is hooked up to the PC via a long composite lead. All wireless gadgets need to get their power from somewhere, and these three devices run from a pair of (included) AAA batteries each. As you would expect, they all consume the most power when you're moving the trackball. Pressing keys makes little or no difference; the LED driving the trackball's sensor uses far more juice. All of the units are smart enough to realise this, and put the trackball into various power saving states by pulsing the LED more slowly when you're not using it, just like modern wireless mice. The two keyboards take this one step further, by eventually powering down the trackball entirely. Under load, the Slimline keyboard uses about 30 milliamps, but this drops off to around 0.5mA when it's idle. At this rate, a set of 900mAh AAA rechargeables will theoretically last 75 days. In practice, they'd flatten themselves before this, but even with heavy use you're sure to get more than a month out of them, and a good set of alkalines will last even longer. The Multimedia keyboard maxed out at only 12mA - suspiciously less than the Slimline. Idle current draw was similarly lower at 0.14mA. It's possible my jury-rigged ammeter was confused, but it doesn't matter all that much; either way, rechargeable batteries will go flat from internal leakage long before the keyboards actually drain them. The Presenter has a similar maximum draw to the Slimline keyboard - 32mA under load, with an additional 10mA when you use the laser. As it never completely shuts off the trackball, its idle current draw is higher - 3.5mA. This works out to about 10 days with our 900mAh rechargables - not a terrible figure, but this is why the Presenter has an "off" switch. Here in Australia, Aus PC Market sell the Slimline keyboard for $AU110 including Australian delivery, and the Multimedia keyboard for $AU99 delivered. The little wireless Presenter is $AU69.30 delivered. A quick Google search has also turned up an international reseller or two; a mob called Performance-PCs.com have the Slimline for $US59.95 in the States. So none of these gadgets are hair-raisingly expensive. Of the two keyboards, the Slimline is definitely the more attractive to look at, and it's smaller and lighter. For casual use, or to blend in with a home theatre PC setup, it's the obvious choice. But if you're planning on doing much typing, I'd go with the better-feeling Multimedia instead. 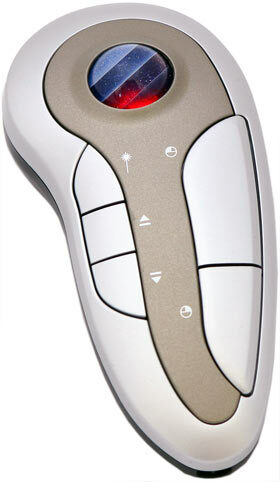 Likewise, the Presenter is very handy for its intended use, but you wouldn't use it as an everyday pointing device. All three of the wireless wonders here are solidly built, not too frighteningly expensive, and work quite well. That said, for everyday, normal PC use, you still can't beat the price and functionality of a wired setup. But in their own niche, these three gadgets are good performers and get the thumbs-up from me. This review is a couple of years old, now, and Aus PC Market no longer stock these items (though, as of early 2009, they do still have the Globlink mice reviewed here). Aus PC have, of course, other mice and keyboards. Globlink's page for the keyboards is here. The page for the Optical Presentation "Mouse" is here.